Like everything else, fashion too has evolved greatly in the last 63 years of our country's colourful journey. One outfit, however, continues to hold a special place in every fashionista's wardrobe. We take a look at the many shades and styles of the evergreen saree. 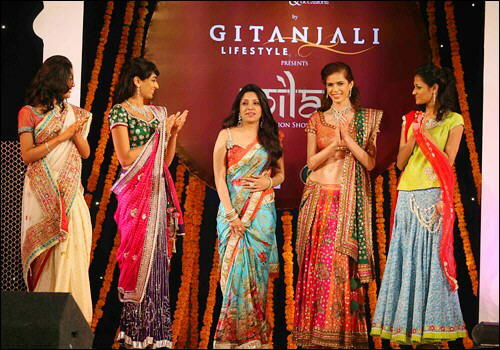 A designer in a saree walks the ramp, as her models, also in sarees and lehengas look on. With her curvy body and all Indian good looks, Priyanka Chopra is like a poster-girl for sarees. Actress Rekha is known to be partial to elaborate sarees with a generous touch of gold. The younger generation has also embraced the garment. Dia Mirza here looks elegant in a dull gold saree. The tall and statesque Deepika Padukone looks absolutely glorious in her pinkish-orange saree. Urvashi Sharma plays up a simple saree with a seriously blingy blouse, with a cut-out detail in the front. Vidya Balan, who was earlier criticised for her dressing sense, has taken to the saree with a vengeance. 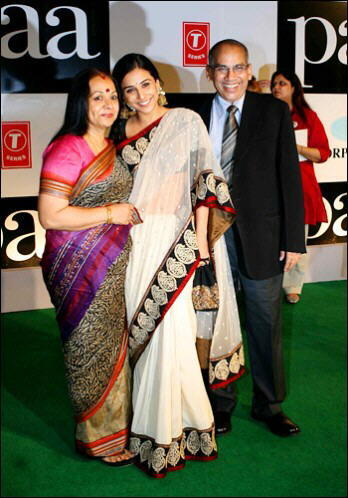 Vidya wears a saree by her favourite designer Sabyasachi. Straight off the sets of 'Ishqiya', where Vidya plays a village belle. 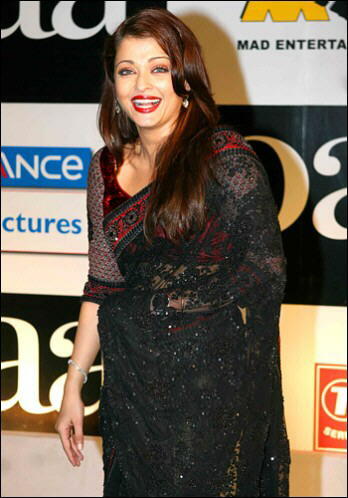 Aishwarya Rai in a dark and attractive version of the garment. And then in a pretty pink one. 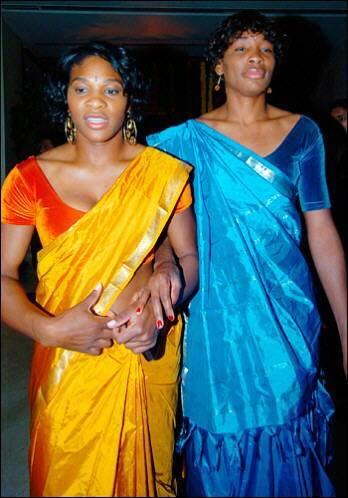 Even foriegners can't resist the charm of the saree, as is evident by this picture of the Williams sisters. Claudia Ciesla wears a grey and mauve net saree. Mrs Ben Kingsley goes for the kill in a bright red saree. Bobby Darling in a black lace saree. Along with the saree, it's accompanying blouse has also taken on many forms. Jacqueline Fernandez wears a high neck blouse with her printed saree. Kangana Ranaut adopts the popular net saree. Urvashi Sharma glows in a black net saree. Celina Jaitley matches her traditional saree to an oversized bindi. Kajol is absolutely breath taking in this elegant number. 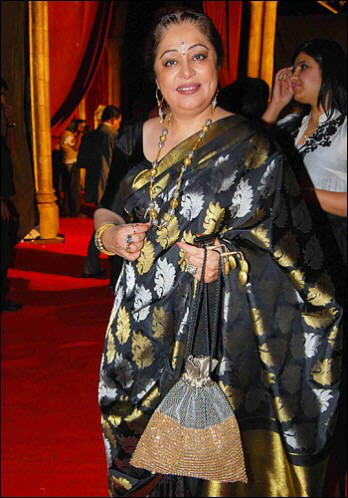 Kirron Kher in a stunning black saree with gold and silver detailing. 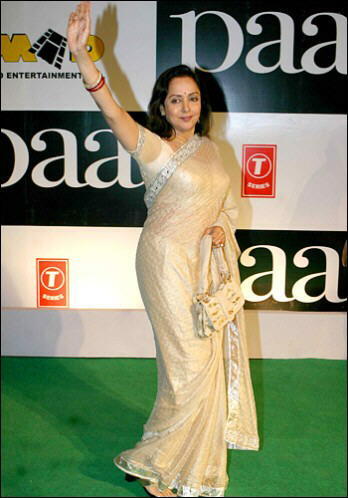 The ever-elegant Hema Malini goes for a muted cream saree. Divya Dutta gets experimental with her saree. Designer Neeta Lulla in a shaded saree. 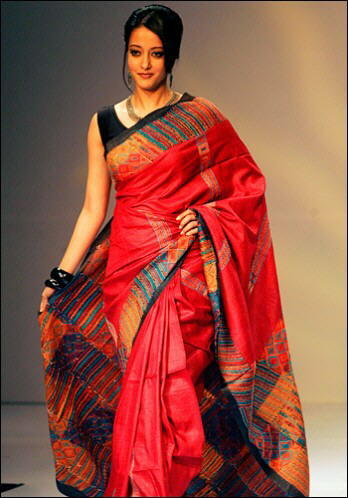 Even super models love sarees! Jesse Randhawa is a vision in her white saree and green blouse. Raima Sen walks the ramp in a saree made by the weavers of Kolkata. A model poses on the ramp. 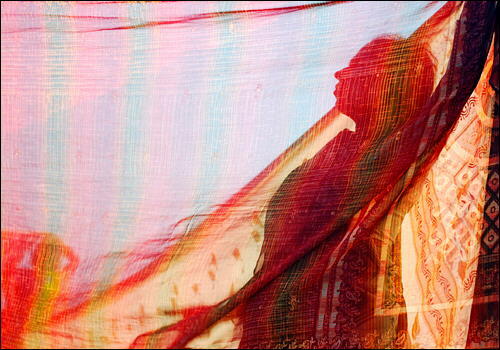 The many forms of a saree live on and on and on.